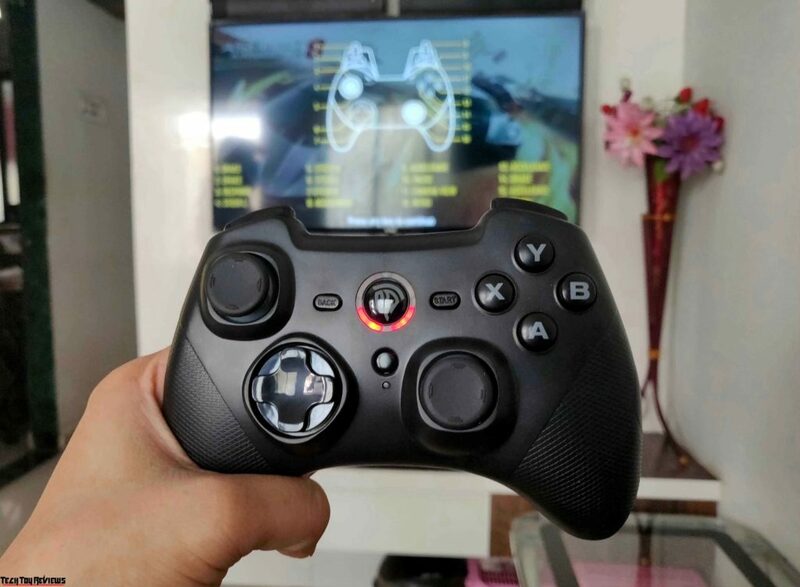 When it comes to best of multiple segments, it’s always nice enjoying the advantages of various things at the same time and that is exactly what you get with the EasySMX ESM-9101 Wireless Gaming Controller! 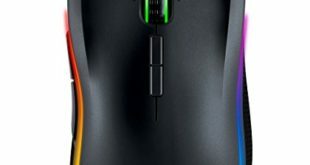 The Keyboard and mouse, as well as mobile screen, is more than enough for gaming if all you play is PUBG or Fortnite or similar games. When you start playing games with complex controls, a good controller helps a lot. Controllers are obviously not going to fit in your pocket, but having dedicated physical buttons for all your controls is a big plus. You’ll also appreciate the controller if your multiple devices support the same controller you own. If you’re looking for a controller for your PC, smartphone, TV, TV Box and PS3 devices your choices include the affordable EasySMX ESM-9101. We used the ESM-9101 for a week with a variety of games. Here’s what you need to know if you’re thinking about buying it. 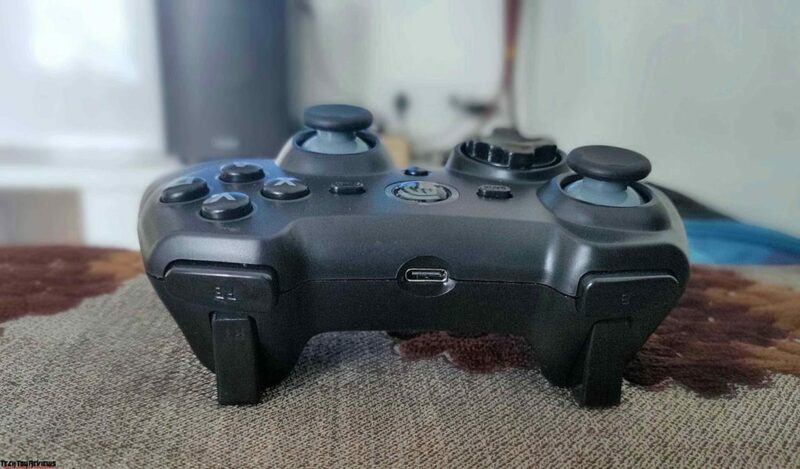 The EasySMX ESM-9101 Wireless Gaming Controller ‘s outer shell is made of tough plastic that has a rugged grip that makes it a perfect fit in your hand. 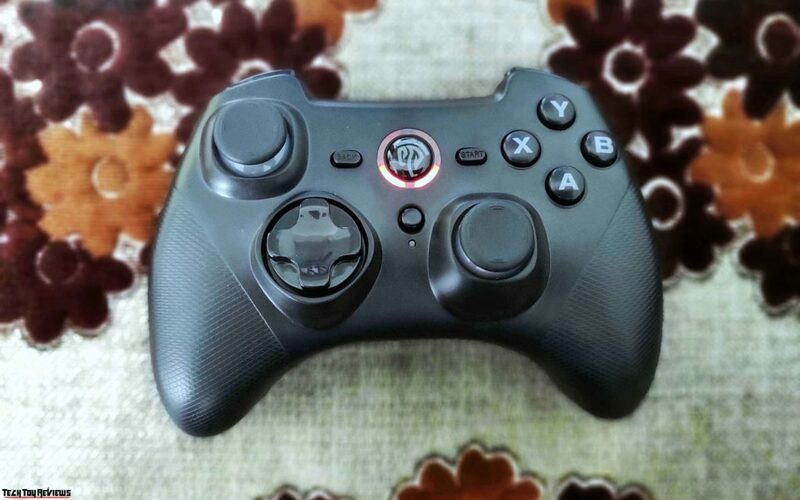 Its two analogue sticks have a rubberized coating and have a turbo button in between the joysticks, we also have the back and start buttons and the power and mode button at the center. The analogue sticks were easy to grip and gave us no trouble as well, we do not find hard to use the other rubber buttons. Those four buttons placed perfectly and the Start and Back buttons, in particular, is a bit too small, but manageable. Other than that, all buttons are made of plastic. 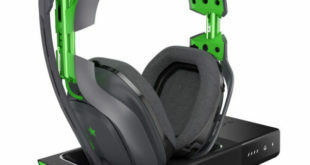 This includes the four-axis D-pad, four buttons (A, B, X, Y), two shoulder buttons and two trigger buttons. The trigger buttons curve outwards, and longer which is great if you play shooting games and gives a better grip. 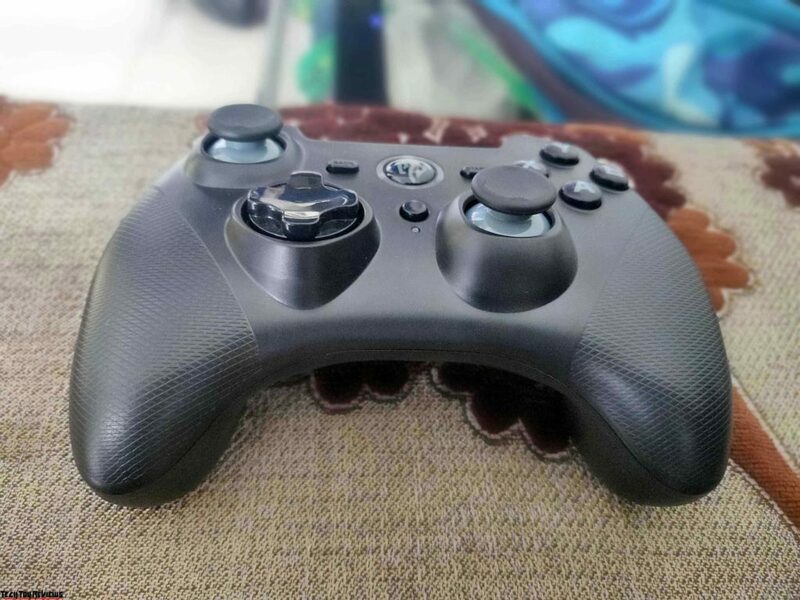 The front of the controller is quite monochromatic with the only standout in the middle is the Turbo button with EasySMX logo and covered with small LED indicator. You can take advantage of it all you have to do is press and hold the button you like, and then press the turbo button, the LED will flash indicating that it is now enabled. Now you can press and hold the designated button anytime for continuous gunfire and whatnot. 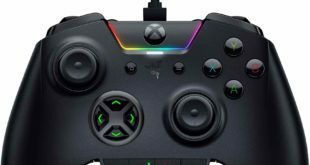 The back of the controller has no major design nor any control features. The controller pairing with support devices is very easy, performing the initial setup for PC is quite straightforward. You’ll need a spare USB port and the included wireless receiver. 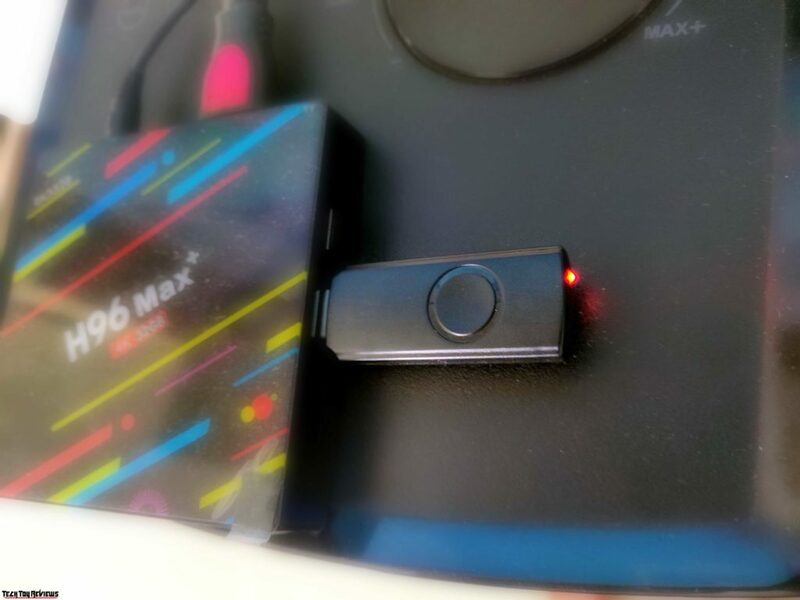 To begin setup you insert the receiver into an empty USB port and press the middle mode button for 5 seconds to change to various modes. If the connection has been successful, the LED should be illuminated. Connecting to Android mobile is a little different, you’ll require a smartphone that has OTG support and an OTG adapter. If your phone has OTG support, this would need to enable before using the controller. So be sure to check OTG support is enabled before attempting to pair the controller. You may also need to purchase an OTG adapter as there is not one included in the box. Once you have an OTG adapter and OTG support enabled, connecting the controller is as simple as placing the receiver into the OTG adapter and pressing the home button on the controller. The controller should then auto connects and if successful, LED 3 and 4 should be illuminated. 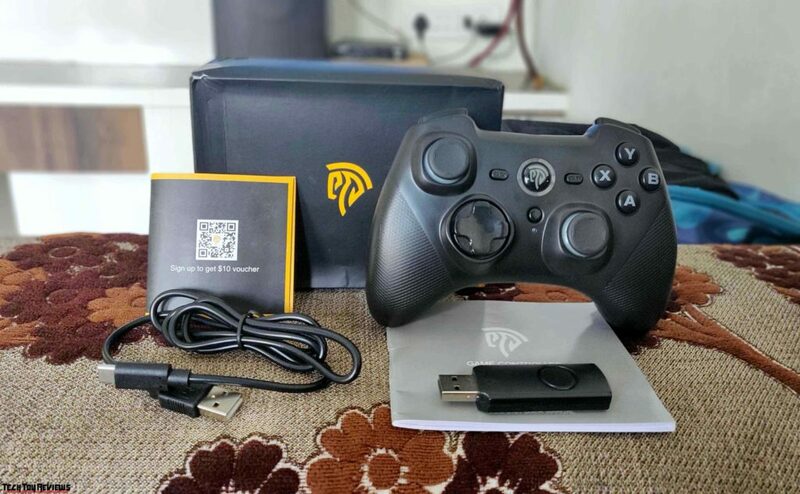 We paired the EasySMX ESM-9101 with OnePlus 6 and Android TV Box to test games. Once paired, the controller lets us use the device without touching the screen for everything except typing. We could open apps, select various options, and return to the home screen using the controller. The games we used for testing were Asphalt 9, Real Racing 3, PUBG Mobile and Fortnite. We enjoyed playing all of these games with the EasySMX ESM-9101. Asphalt 9 and Real Racing 3’s controls felt best suited to the controller thanks to excellent optimization by the developer. Our turns and drifts felt far more precise using the controller. Similarly, we loved playing PUBG Mobile and Fortnite using the device. Moving around, aiming, and firing was pretty easy to accomplish with the controller. The four buttons – A, B, X, and Y are tactile and we had no trouble finding the right keys for the shooting. 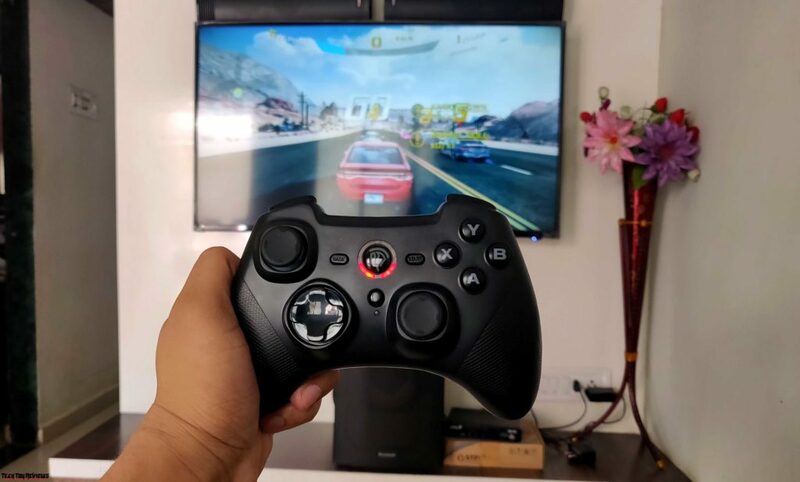 While playing games with this controller was fun, it also uses Xinput API, it has all the functions of an Xbox 360 controller including the vibration feature, so it’s a realistic goal for the controller. 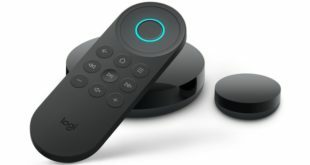 Apart from smartphones, we tried to connect the EasySMX ESM-9101 with the Android TV Box. The wireless controller worked perfectly, we connected it via the same wireless receiver and worked perfectly in both cases. Connectivity was good throughout testing, and we never saw the connection become unstable or even have the connection be fully dropped. The maximum range is up to 10m given a straight line of sight, but in all honesty, you’re unlikely to be using the controller at that range. Battery life on the EasySMX ESM-9101 is quoted at up to 8 hours use. Our testing revealed that this is accurate as we achieved a bit over the 8 hours quoted. The EasySMX ESM-9101 also adopts an auto shutdown feature when the controller isn’t being used, which is handy for preserving battery. The EasySMX ESM-9101 is a fairly good Wireless Gaming Controller and it isn’t too expensive – available online for $25 via EasySMX or Amazon stores and works with pretty much every game that supports controllers. We were pleased with its trigger and shoulder buttons, analogue sticks, and tactile A, B, X, Y buttons. We charged it once via the included micro-USB cable so this is a pretty decent gaming accessory.